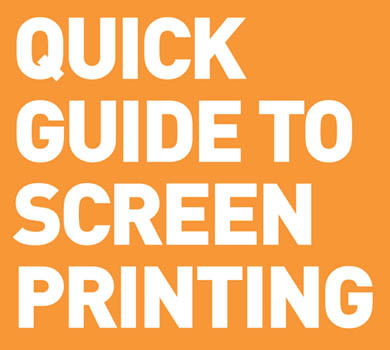 We talk to a lot of people who want to start screen printing but are not quite sure of the process and what’s really involved. So we thought we would write a high level process overview, to give you a little insight into how to get started. If you are a hobbyist, artist or commercial printer, the processes are pretty similar. We are going to work through the process of taking a blank garment to producing a garment with a printed logo. How can we help? Look out for this font as you read through, for tips about how Wicked Printing Stuff can help with services, products and as you get bigger and have higher volumes, our automated equipment. Successful efficient printing requires a bit of planning and a little discipline, especially when it comes to keeping the studio nice and tidy. At a high level the first set of ‘preparation’ steps cover preparing the artwork, getting your screens ready and exposing the artwork to the screen. 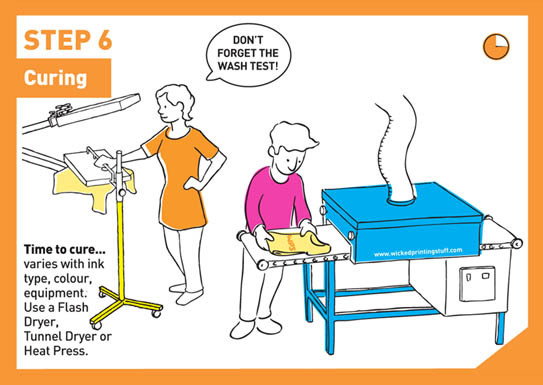 The second set of ‘printing’ steps are about preparing your bench or carousel and getting printing, with the final set of steps ‘finishing’ covering curing the ink, reclaiming the screen so that you can use it again for different artwork and of course tidying up. Preparing the artwork: most printers normally use software such as Adobe and CorelDraw to create the artwork but you can use whatever you are most comfortable with. There are some great online tutorials which cover the software settings and the things you need to do to prepare your artwork. If you are a beginner start with a single colour simple logo and work your way up to more complex multi colour prints. You will need to print the logo onto transparency film using a standard inkjet printer. When printing the artwork, make sure you have set the printer to produce the image as black as possible. As a tip you can print two films of the same artwork and stick it together to make the artwork completely black when you expose the screen. In this category you will find a range of professional transparency film both in sheets (A4 and A3) suitable for use with either laser or inkjet printers and for wider format printers – Ulano Ink Jet fim rolls (from 17″ to 60″ wide). Check out our screen printing tutorial (Step 2 Film Positive – 01 min 59 secs) which discusses the different types of film. Print and Cut Film for creating direct to screen stencils (also suitable for use with the WPS So Easy Kit) without the use of photo sensive emulsion. Transfer Release Paper – for screen printing transfers we are offering both Cold and Hot Peel papers. MagicTouch transfer papers suitable for use with the OKI TMT Colour Laser Printers. 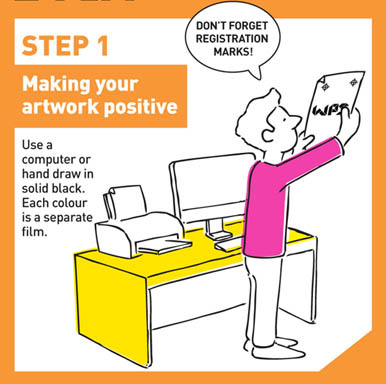 The image above is showing registration marks, these are useful when creating multi colour artwork as you have to produce a screen per colour, and when you come to print, the registration marks help you to align the print. Once the artwork is ready, you now need to prepare your screen. You need to choose the right mesh count for your artwork. Common mesh counts are 43T for t-shirt printers and higher mesh counts for detailed artwork such as 90T. 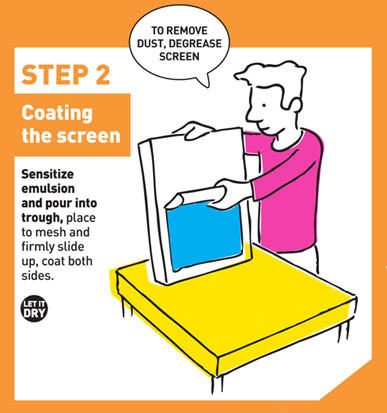 You need to coat the screen with photo sensitive emulsion, follow the instructions on sensitising the emulsion before use. In a subdued lit room pour the emulsion into the coating trough and coat the screen. Coat both sides as it is important to create a stencil on the screen that will last. If you are using a waterbased ink you will need to choose a water resistant emulsion, for solvent based inks make sure you use a solvent resistant emulsion. If you get the combination the wrong way round your stencil will start to disappear when you start to print. When you have coated the screen, leave it to dry in a dark area. Once dry, you are ready to expose the screen. There are lots of different exposure units and lamps to choose from. If you are on a tight budget and not exposing screens every day, an exposure lamp is perfect to get going. Exposing screens is probably the most challenging area for a novice but stick with it, expect some mistakes with your first exposures but practice makes perfect. In this category you will find a range of exposure units, digital screen makers, accessories and kits which are used for transfering your artwork onto your screen. We sell a range of ‘all in one’ self contained exposure units suitable for mid to large sized screen printing shops. The Actinic and WPS Mini Exposure units ideal for educational and medium sized screen printing businesses (typical exposure times 120 – 180 seconds) and the heavy duty units ideal for busy print studios and larger screen printing businesses where large numbers of exposures required per day (typical exposure times 30 – 90 seconds). Digital Screen Makers, allowing you to transfer the artwork directly to the screen without the need for emulsion, exposure units, washout equipment and film positives. Great for increasing productivity and screen turnaround times. For beginners, smaller businesses and home printers we manufacture the Wicked Exposure Unit , very cost effective. Additional foam base sizes can be purchased as extras for other sized screens if you require. 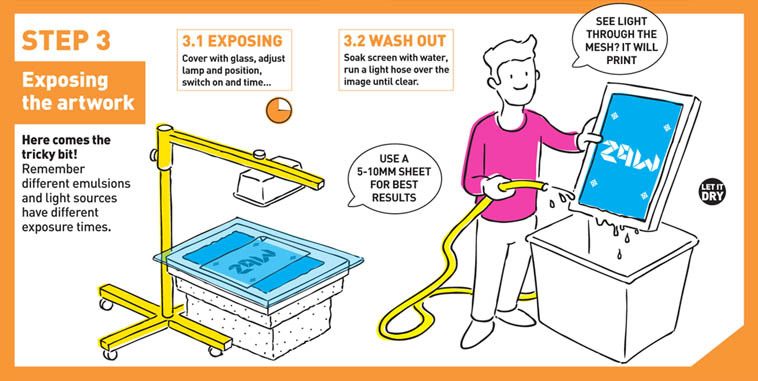 Check out our screen printing tutorial (Step 4 – 7mins 10 seconds if you want to skip to the relevant section) which shows how you use the Wicked Exposure Unit to transfer your artwork to the screen. When using a lamp you will need to expose in subdued light, with self contained units you can expose screens in normal conditions. Always check the instructions which come with your emulsion as you will need to follow the timings based on the type of light you are using. When you have exposed the screen spray water at a medium pressure onto it which removes the emulsion leaving the stencil. Tape around the edges of the screen once it has dried using brown tape to make sure that the ink will only go through the areas of the screen not covered in emulsion. Printing: You need to register the print to make sure the print is exactly where you want it to be on the garment, and for multi-colours the image fully aligns. Use Hi-Tak spray or platen adhesive to make sure the garment does not move when you are printing. Tabletop carousels – are designed and built by us in the UK, high quality, versatile, proven and ideal for space constrained areas. Comes with features such as micro registration which is normally only seen in more expensive floor standing equipment. Floor Standing Manual and Semi Automatic carousels – We manufacture own range of cost effective carousels and we are also the UK dealer for the WEISS range of carousels and presses. The quality of engineering is simply breath taking, the Weiss range is best in class, designed and built to last. Hand Bench range – we sell a range of high quality screen printing hand benches ideal for poster, transfer and sign printers. The bench includes features such as a squeegee arm and industrial level vacuum pumps ideal for the educational market, screen printing clubs and screen printing shops. Add the ink to the screen with a palette knife, then flood the stencil with the ink. Keep the screen two inches above the garment and use the squeegee to cover the stencil with the ink. When you are ready to print place the screen over the garment, put both hands on the squeegee and pull it towards you with a firm even motion, pushing the ink through the mesh onto the garment. Make sure you go over the whole stencil, stopping as you reach the taped area. Lift the screen and you will see the image is now on the garment. Sometimes you may need to do a second pull, especially if you are using thick ink. Touch dry the garment using a flash dryer or heat gun. You have printed your first T-Shirt! If you are only printing one colour you are now ready to cure the garment. Regardless of what ink you have used to print, it will need to be cured before the job is finished. The type of equipment you use to cure will depend on the type of ink you have used to print. There are many different pieces of equipment that can be used to cure a print. If you have used water-based ink: Although waterbased ink dries to air, it takes a high temperature to cure water-based inks. You can cure the ink at 180°C by using a flash dryer, tunnel dryer or heat press. If you mix a catalyst with the ink you can cure the ink with a heat gun. If you have used Plastisol or other solvent-based ink: In between the application of the different colours of your design you can use a heat gun to flash dry but to fully cure you should use a tunnel dryer, flash dryer or heat press at 155°C. We have a range of curing equipment to meet every requirement, all designed and manufactured by us in the UK. WPS Flash Dryer – Ideal for home and workshop conditions. Suitable for flash drying between prints and for low volume garment curing. Panther Flash Dryer – Ideal for the medium to large screen printing business. We offer the most comprehensive range of Tunnel Dryers in Europe, including the well known Panther range. Wicked Mini Dryer – One of the most efficient dryers on the market. Ideal for small workshop conditions designed for large printing runs. Texitunnel 8220 – ideal for automatic screen and digital printers. High curing throughput. Don’t forget the wash test! Remove all the screens from the printing press and carousel heads. Scrape any excess ink off the screen and squeegee and put it back into the pot. USING WATERBASED INK? Wash your screens down thoroughly with a water hose. 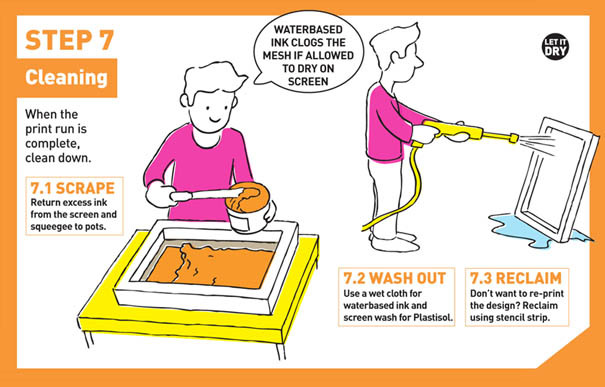 DO NOT allow the ink to dry on the screens or it will clog the mesh. Once the screens are clean you can either dry them with a fan heater or leave them to air dry. USING PLASTISOL OR OTHER SOLVENT BASED INK? Clean your screens with screen wash and make sure to clean both sides of the screen thoroughly. You can also buy the WPS Screen Printing Cleaning Kit which includes the key products you will need. Rack your screens vertically ready for your next run. If you are not going to print a design any more it’s time to reclaim your screen so that you can use them for something new. ‘Reclaiming’ is the act of striping the stencil from your screen in order to create a new strencil and start the printing process over again. WPS sells a variety of equipment and products for this process including dip tanks. 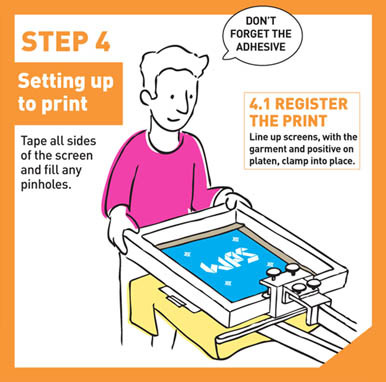 So that is our Dummies Guide to Screen Printing, I hope it has helped you but if you need more information please contact us, we are always delighted to help and advise on any aspect of screen printing.